For Standalone use, you have a few options when creating your calendar. Use the soSIMPLE events table. 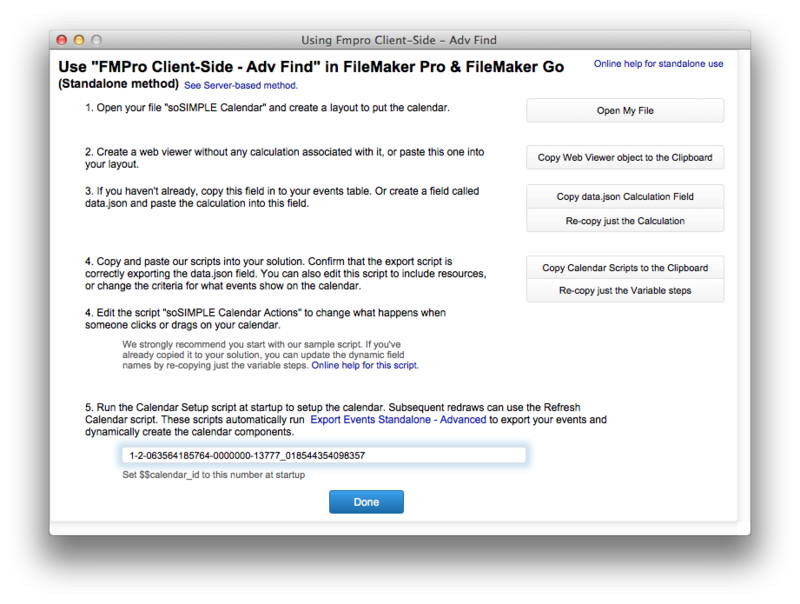 Start with our included soSIMPLE Calendar solution file and build on to it to include your custom features. This includes all the logic for choosing the appropriate calendar, and is the simplest method for getting up and running fast. Using this method, you’d keep the included calendar_data table for your events, and connect your existing solution as you’d like. Re-point the calendar_data table occurrences in soSIMPLE Calendar file to your own events table. Remap the Data Source settings to show your data in the calendar. Copy the data.json calculation field and paste it into your own events table. Modify the “Open” section of the soSIMPLE Action Script to run a script in your own file (to open an event when you double-click it. Review and modify the Export Events script as necessary. Pay special attention that you’re exporting the data.json field all by itself. Make sure that the data.json calculation is in your events table, and the “Let” statements at the top of the calculation are set to the correct fields. (once you’ve set up your data source, you can copy the data.json calculation field to paste into your table, or just the contents of the calculation that you can paste into the calculation window). Make sure the variable steps at the top of the soSIMPLE Action Script points to the correct fields. You can Re-copy these variable steps from this window. Set a global variable at startup called $$calendar_id and assign it to the $$calendar_id shown in this window. If you make any changes to the data source settings, you should click “Re-Copy just the Variable Steps” and paste these three script steps in the top of the soSIMPLE Calendar Action script. If you make any changes to the data source settings AND you are using Standalone mode, click “Re-Copy just the Calculation” and paste into the “data.json” field, replacing the entire existing calculation. You can use parameters to go to the right date or view by adding parameters to the URL in the web viewer.